WT 4000 - Maximum up time! 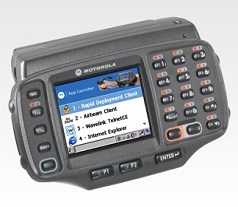 Arm your workers with advanced real-time hands-free mobile computing with the Motorola WT4000 Wearable Terminal. This rugged device will allow you to achieve maximum error-proof productivity, operational efficiency and accuracy through voice compatibility for streamlined warehouse and package handling functions. Ensure dependable operation in challenging warehouse environments, including the cooler and the freezer; reduce device replacement costs; and maximise uptime: IP54 sealing and 4 ft/1.2 m drop specification across the entire operating temperature range. Support for hands-free text and voice-based picking eliminates effort and cost associated with purchasing and supporting multiple systems for different applications. Ensures operation in a wide range of warehouse temperatures, including -20Â°C in freezers.